The other day I made low carb pork chops. Pork chops are already low carb but if you make them my favorite way, coated with bread crumbs and fried, they are high in carbs. So a low carb recipe was needed. Replacing the bread crumbs with an almond meal mixture tasted really good. Pretty much identical to regular bread crumbs so this got me thinking. I should replace all of my recipes with breading with this low carb breading. So today I decided to try making low carb eggplant rollatini. 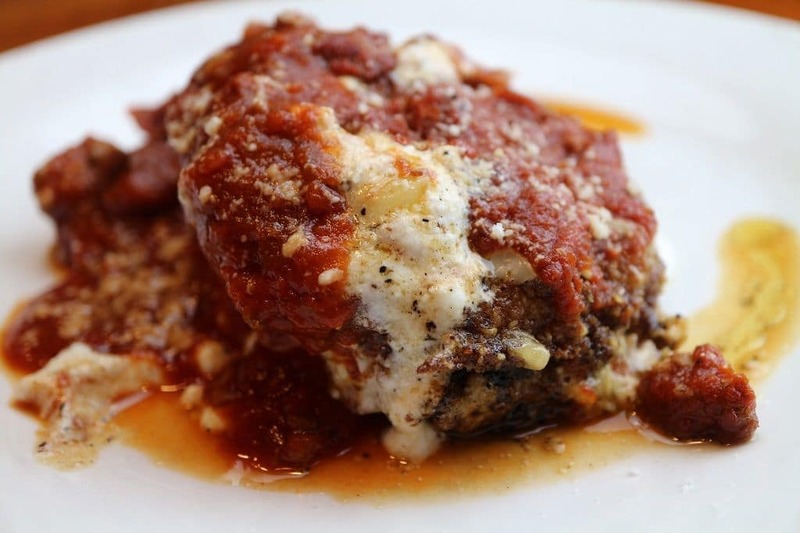 Eggplant Rollatini is basically eggplant Parmesan but with more cheeses. And the additional cheese is ricotta. You take the fried eggplant cutlets and roll them with ricotta cheese inside. Then you put them in tomato sauce and top with mozzarella. Definitely an outstanding Italian meal. A couple of things to remember when making Low Carb Eggplant Rollatini or any kind of Eggplant recipes. You want to peel the skin off. I know a lot of people eat eggplant with the skin on but those are not my people. When I used to work in a diner and people would order eggplant Parmesan (seriously, who orders Italian food at a greasy spoon diner? I was taught to cut the eggplant and fry it with the skin on. That shocked me because at that point in my eating career, I didn’t even know you could eat the eggplant skin. If you see a recipe that calls for salting the eggplant, you can skip it. Sometimes eggplant can be bitter. So to salt eggplant you would slice it and sprinkle it with salt. Then you let it sit for a half hour. The salt draws the bitter juices out of the eggplant. Then you take a paper towel and wipe off the moisture before continuing your recipe. 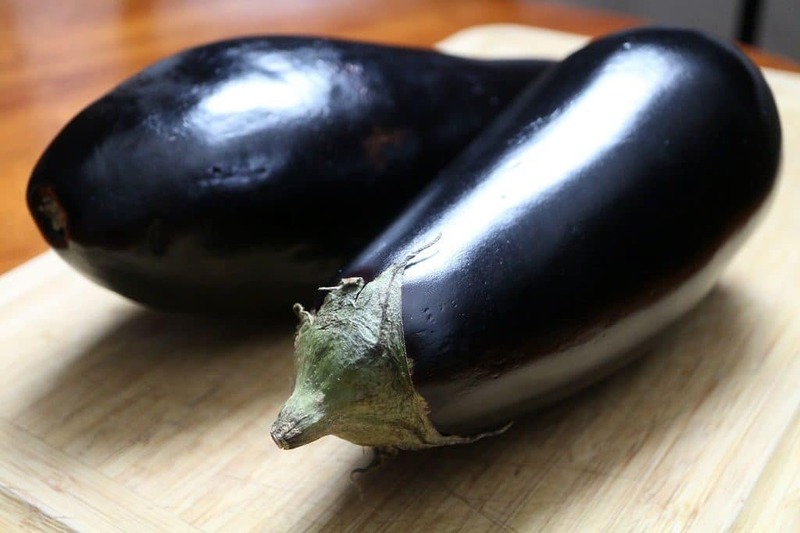 Nowadays, eggplants have been bred to be less bitter. So you can definitely skip this step. But if you want your fried eggplant to absorb a little less oil when you fry them, you can put them in a brine for a 30 minutes. Just some salt and water will do the trick. Be sure to dry them well before you fry them. So like I said, replacing the bread crumbs with an almond meal mixture is a great way to make low carb breading. Now if I really wanted to be good, I could put these in the air fryer and use very little oil. But come on, give me a break. 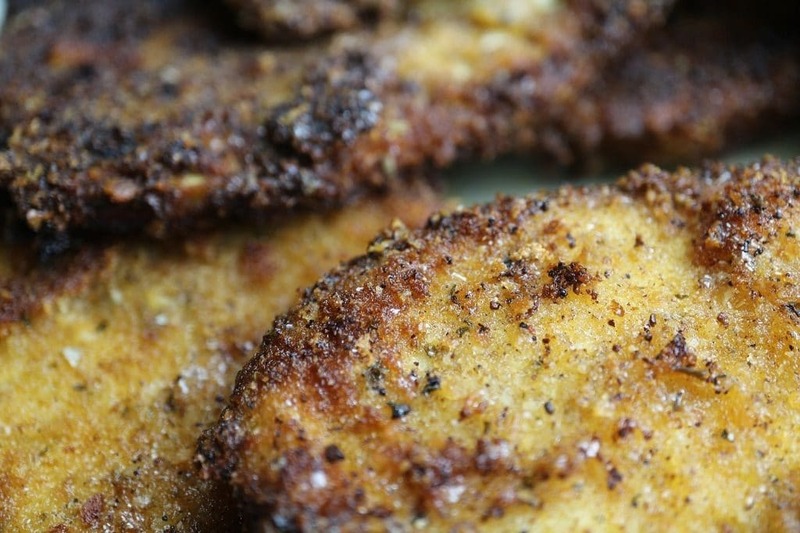 Eggplant cutlets are meant to be fried in olive oil and put on a paper towel. Seeing oil soaked paper towels with cutlets on them is a part of my childhood that I don’t plan on replacing with with healthy options. Well at least not all the time. These Low Carb Eggplant Rollatini were really tasty. I think this almond meal breading is the way to go so that I can still enjoy some Italian food and cut out the carbs while I’m doing it. You can still enjoy Eggplant Rollatini on a low carb diet. Just replace the bread crumbs with a low carb almond meal mixture and you won't miss those carbs at all. Dip eggplant slices into eggs and then place in Almond Meal mixture to bread. Press mixture onto eggplant to cover if necessary. Set aside breads eggplant slices. Place breaded eggplant slices into oil and cook about 2-3 minutes per side. When cooked, let drain on a plate that's layered with paper towels. 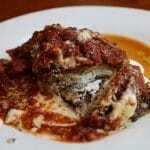 In baking dish, add a spoon full of ricotta cheese to an eggplant slice and roll it. If the eggplant is too thick to roll then make layers with two eggplant slices and ricotta cheese sandwiched in between.